In 1856 Judge John K. Kane, in partnership with others, bought a large tract of land in McKean, Elk, and Cameron Counties and organized the "McKean and Elk Land and Improvement Company." Swedish immigrants had settled in the vicinity of Kanesholm as early as 1865 on land sold to them by Judge Kane. However, the first person to settle permanently in what would become Mt. Jewett was William Smith. The Smith family, William, his step-mother, and his half brother, D.A. Smith, established a farm here in 1866. born in Conneaut, Ohio in 1837, he was the son of Lyman L. and Betsy Lytle Smith. The family then moved to Yorkshire, Cattaraugus County, New York. In December 1861, he enlisted in the army and was assigned to Company K, 105 Regiment of the New York Volunteers. He then served three years. In the spring of 1866 the Smith family moved to McKean County. William Smith married twice: in 1871 to Fannie Simmons who died in 1898 and to Mary Brown in 1904. He adopted three children: Mrs. Fred Howard, Alice Smith, and Arthur Smith. On October 23, 1912, at the age of 75, he died from complications of pneumonia. He is buried in the Nebo Cemetery. The village that sprang up here was first known as Howard Hill. It was so named by Chester and William McFall who were originally from Howard Township, Stuben County, New York. The name was changed to Mount Jewett in 1881 to honor Hugh Judge Jewett, the president of the Erie Railroad that had begun construction of a line through the area west of the village. The line would carry bituminous coal from the Dubois and Punxsutawney areas to Salamanca, New York, then to the Great Lakes for export. The first Swedish immigrants settled here in 1871, not in Howard Hill/ Mt. Jewett but rather at nearby Lindholm. The families of John H. Nelson, John Eaken (Aiken) and John Mellander purchased 150 acres of cleared land from General Thomas Kane. In 1875 an advertisement written in Swedish offering more of the Kane land for sale appeared in a Jamestown, New York newspaper. Jamestown already had a considerable Swedish population. 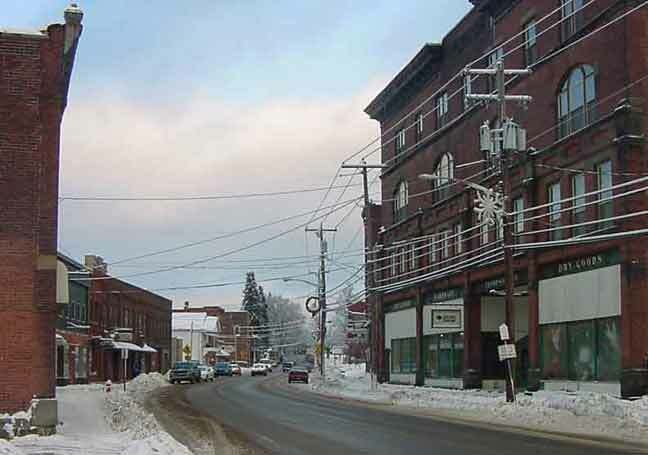 McKean County was described as a growing area, one that would continue to grow and provide opportunity because of the railroads in the region. The land was said to be suitable for farming, well watered and productive. It made note of the first-class grassland, the rich forest and the availability of limestone. The land was to be sold off in 50 acre farms for the price of $4 to $13 per acre. To further open up the area to settlement and for the movement of goods, General Kane established the New York, Lake Erie and Western Railroad and Coal Company. In 1882 the General was faced with the dilemma of how to extend the rail line across the highlands south from Big Shanty. Progress was hindered by the Kinzua Valley, 300 feet deep and 2,000 feet across. Either snake the line down one side and up the other, or go over it. He investigated the latter possibility. The men who made the Kinzua Viaduct a reality were Oliver W. Barnes, chief engineer of the railroad, and Anthony Bonzano of the Clark Reeves Division of the Phoenixville Bridge Company. On May 10, 1882, about three miles north of Mt. Jewett, a crew of forty men began construction. The structure was completed 94 working days later. At a cost of $167,000, it was 301 feet high, 2,053 feet long, and contained 3,105,000 pounds of ironwork. It was the highest railroad viaduct in the world and was advertised as the Eighth Wonder of the World. With the abundance of natural resources in the area, including oil, timber, limestone, clay deposits, and farmland, the village experienced steady growth. Due to the steady growth, the first post office opened in February of 1882 at the corner of Main Street and Brennan Avenue where the Charles Buzard house now stands. The postmaster at the time was August Mellander. The first industry in the Mt. Jewett Area was N. D. Battison's basket factory which was established in August 1883 when Mr. Battison leased free from Elisha Kane a three acre lot for such a factory. Mr. Kane gave him $175 and also a large lot for his dwelling, the only consideration being the establishment of this industry. Earlier that year the town plot was surveyed, and with this industry, employing twenty-five persons, the nucleus of the present village formed. However, some of the people opposed the location of the factory earnestly. A fire destroyed the buildings soon after, but the owner rebuilt and continued in business some time. The building passed into various hands, and eventually was occupied by Hitchcock & Davis. 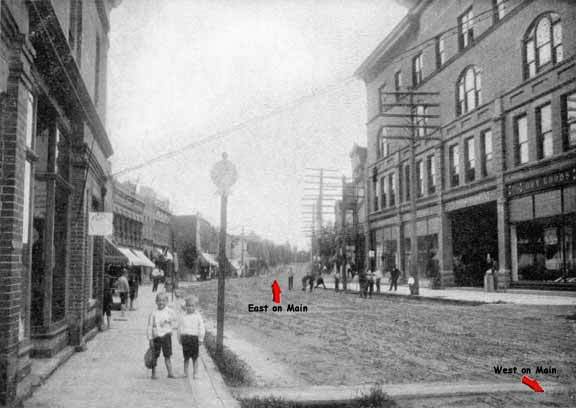 The R. & P. R. R. was also completed the same year as Mr. Battison's basket factory. In 1887 F. W. Andrews began a series of seven test wells on the Kane lands, which led to the development of the field by the Anchor Oil Company. The first of the wells, one and one half miles northeast, showed gas in small quantity at a depth of 900 feet. This with others reverted to Mr. Kane, and he conceived the idea of supplying Mount Jewett with natural gas. With some difficulty thirteen consumers were secured, and with the gas proving itself worthy of its claims, caused the list was increase to over 100 consumers. At the beginning Mr. Kane could not obtain one subscriber to a proposed stock company. At this time the system extended from McAmbley's mill to the village. The McAmbley saw-mill, three miles northeast of Mount Jewett, is an important industry, Hitchcock & Davis's saw-mill was devoted to the manufacture of hardwood, Mellander's mill is northeast of the village, Campbell's saw-mill, a mile south of the village, was a large concern, but in July, 1889, the machinery was moved to Kane to make way for Huff's hardwood factory. Southeast of the village are the Roos saw-mills and the Kinzua mill, six miles from Kane, was burned in July 1887. The McClelland & Kane model mill was erected at Mount Jewett in the fall of 1889. M. H. Manning was superintendent of the building and machinery for the McClelland & Kane model mill. The first church in Mt. Jewett was the church of the Mission Friends in 1887. A Lutheran congregation was formed in 1886 in the home of Gustaf Larson, and in 1887 the Swedish Evangelical Lutheran Nebo Church was built on a hill near the village. The Nebo Church was incorporated in September 1888. B. C. and A. Lundberg, Oscar Wiborg, and J. Mellander were subscribers. Also the Presbyterian Society was formed in July 13, 1888, and was incorporated on July 25, 1888, with O. B. Mosser, B. V. Thompson, E. W. Hevner, W. W. Brewer , L. A. Groat, and Hubert Schultz as trustees. All were members except Brewer, Hevner, and Thompson. The list of original members also included Calvin Gray and wife, Mrs. W. W. Brewer, E. A. Conn, Mrs. Thompson, Mrs. Groat, Mrs. Schultz, and Mrs. Mosser. Work was begun in July on a new church house and was completed in October. Rev. W. J. Arney of Kane organized this society and was it's first pastor. The Aldrich Cemetery was incorporated in Ma 1877, with H. W. Burlingame, G. O. Garlick, O. Perry, H. L. Burlingame, J. E. B. White, and Hiram W. Burlingame as the trustees. Fisher Tent of the K. O. T. M. was organized at Mt. Jewett in May 1887, with James Doyle, Owen Coyle, L. A. Groat, De T. Parrish, C. W. Obing, W. H. Reese, A. A. Van Slyke, W. J. Jackson, Dan. Shea, M. Sylvester, N. Marsh, R. Jackson, and O. McLoud filling the several positions.